You will need a Visa to enter Bolivia if you hold an American passport. One of our favorite off-the-beaten path tours that is sure to captivate your camera lens with breathtaking landscapes. We start in Chile with a 6 day hike on the Silver Road, and adventure into the most arid desert in the world, Atacama. The extraordinary Salar de Uyuni, located amid the Andes in southwest Bolivia. This is the world’s largest salt flat - a desert-like, 11,000 km landscape of bright, white salt and rock formations surrounded by cacti-studded islands. Its otherworldly expanse can be observed from Incahuasi Island. 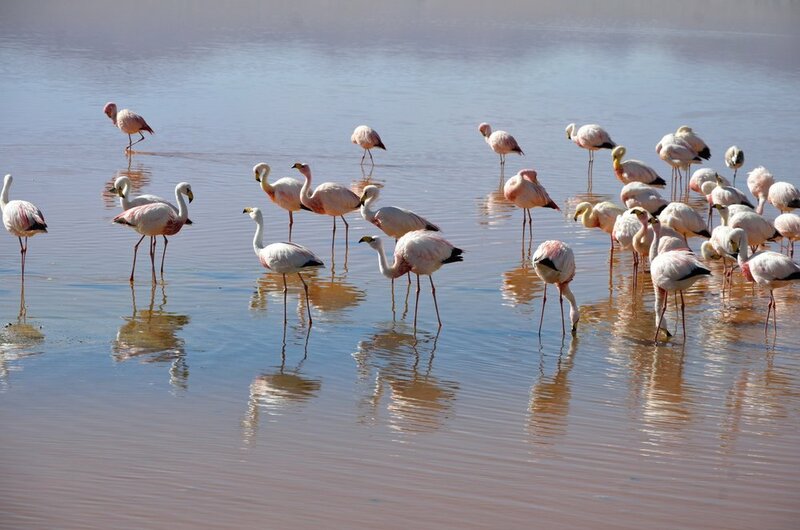 Though wildlife is rare in this unique ecosystem, it does harbour many Chilean pink flamingos! We finish our journey in San Pedro de Atacama, walking the Moon Valley and enjoying extraordinary sights on one of the driest landscapes. Upon arrival to the Arica airport, you meet your guide who drives you to your hotel so you can enjoy the rest of the day at your leisure. Arica is a port city in northern Chile. The pace of Arica is simply delightful. It is warm and sunny all year-round, and there is a calm pedestrian mall to shop around, and sand beaches that are just a short walk from the town center. Near the downtown area, a path climbs up to Morro Arica; it is worth following the path so you can take in the stunning views of Arica and the Pacific Ocean. Another fantastic place to go is the “Museo Histórico y de Armas,” the Pacific War Museum that was designed by French architect Gustave Eiffel with metal and wood. Finally, we suggest you visit the San Marcos Cathedral built in 1876. During the first hike, you get to know a little of the history of Arica city. Founded in 1541 by the Spanish, the city was known within Spanish colony as the “Silver Port.” You continue on to the Azapa Valley and visit the archeological museum. Here you learn about some of the most ancient mummies in the world that belonged to The Chinchorro Culture (5.000 – 1.500 AC). We stop to have lunch on the route. The remainder of the hike involves an ascent to The Andes Mountain Range until the we reach Socoroma. You have dinner at the hosteria (12,000 ft.), where you also spend the night. Today you start from Socoroma and trek to Putre along the Inca Trail again. Throughout the route you see a variety of crossroads that are part of the "Cruces of Mayo" parties. The landscape of the Pre-Andes Mountain Range surprises you little by little with its vegetation, gorges and finally the Tarapacá Volcano (19120 ft.). Once the Tarapacá Volcano comes into view, you know that you are close to Putre. Tonight you spend another night at a hosteria. You have breakfast at the hosteria, and trek from Putre to Picane Cross with views of the beautiful rock paintings of Vilacuarani. During the trek, with some luck, you could see “tarucas,” a kind of deer that lives in the pre-mountain range of Arica. The views you have during your stroll are simply marvellous. We stop for a boxed lunch during the route. You head back to the hosteria during the afternoon and go to the Jurasi hot springs to relieve any soreness or tiredness. The hot springs are located at 13460 ft., and just 6.5 miles from Putre. Later in the evening, you have dinner at a local restaurant. This morning you have breakfast at the hotel before heading off to The Lauca National Park where you become a small part of the vastness that is the 12,000 ft. high Andean plateau. The Lauca National Park was declared a Biosphere Reserve in 1982 because it represents a unique and frail ecosystem with a diversity of plant life and wild fauna. More than 200 different species of birds can be found in the park. You visit Chungará Lake first, located at 4.570 mts. high it is one of the highest in the world. You also have picturesque views of The Parinacota Volcano, 21000 ft. above. You then head to the Cotacotani Lagoons, and carry out your trek toward the village of Parinacota (3.5 hours). Here you have a picnic lunch. From Parinacota, you are transferred to your homey hostel, Lauca-Cruzani (1 hour of transfer). Dinner is at the hostel. You have an early breakfast at the hostel, and after are transferred to Surire Salt Field (1 hour and 20 minutes.). Then you begin climbing Chihuana Mountain, which takes you from 14,770 ft. to 17,388 ft. and takes about 6 hours to complete. The Chihuana Mountain is a relatively accessible summit and does not present major technical difficulties. The view from the summit is simply unparalleled. From 17,388 ft. high, you get a chance to reflect on all of the Surire Salt Field and a variety of summits. During your descent you take a quick visit to the Polloquere Hot Springs at the bottom of Chihuana Mountain. Then you are transferred to Colchane (2 and a half hour), and arrive by the evening to enjoy a dinner at the hotel. You have another breakfast at the hotel, and are transferred to the Chilean & Bolivian boarders. You must go through customs here and switch vehicles before heading to The Coipasa Salt Flat. After two and a half hours, you reach the edge of The Uyuni Salt Flat, the largest in the world (7,500 square miles). After having lunch at The Fish Back Isle, you carry out your stroll in the salt flat to feel its vastness. It is here that you can really appreciate the horizon and roundness of the earth. You then visit The Incahuasi Isle, and have a 360º view of the salt flat from its summit. Later in the evening, you arrive at Tahua, and head to your hotel where you have dinner. You have breakfast at the hotel before your transfer to the community of Coqueza. During the drive we ascend to 13,024 ft. From here you head out trekking to the viewpoint of Thunupa Volcano at 15,748 ft. (about 6 hours roundtrip). You return to the vehicles and have a picnic lunch in the town square. Then, you make your way to San Juan through the Uyuni Salt Field from north to south (58 miles) to arrive by the end of the day. After breakfast, you leave San Juan and go across The Chiguana Salt Field. You make a stop at the Ollagüe Volcano viewpoint. Next, you go to the “High plateau Jewells,” a series of five lagoons one behind another and each one more beautiful than the previous one. Here you see a lot of pink flamingos with a landscape that leaves you breathless. Next you go along the Inca Trail to a closed gorge that is said to have had the “Qhapaq Ñan” (Inca Road) go through. You arrive at your hotel by late afternoon, and have dinner there later in the evening. This morning after breakfast you take a visit to the “Stone Tree,” an interesting formation shaped liked a tree due to erosion from wind and rain. You then continue to the Red Lagoon (Laguna Colorada), which has its color due to the presence of seaweed in its water of low depth. The low water depth also lends itself to being a gathering spot for flamingos. From here you ascend to almost 16,000 ft. high to visit the “Morning Sun” geysers, a nature spectacle that surprises you with mud geysers of diversified colors. Next you travel to the Chalviri Salt Field and The Dalí Rocks. 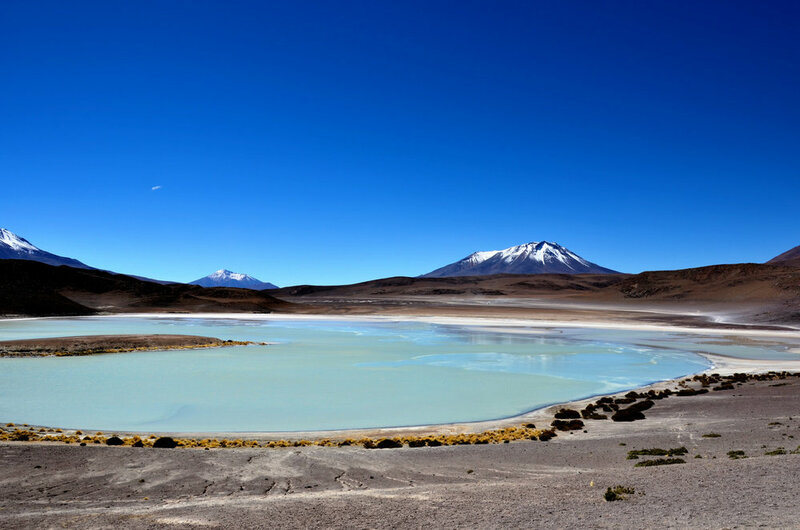 To bid farewell to Bolivia, you visit the beautiful Green Lagoon, which owes its color to the presence of minerals in the bottom of the lagoon. The Green Lagoon along with the Licancabur Volcano make for some incredible photos. From here you go to the boarder, and say goodbye to your Bolivian drivers. After passing through the Chillean boarder, you head down through the most arid desert in the world to the mythical San Pedro of Atacama. This journey takes you from 14,400 ft. to 7,400 ft., and then you enjoy dinner at a local restaurant. You have an early breakfast at the hotel today to set off early to the Toco Mountain zone, ascending to approximately 5,000 mts. high. From Mountain Toco’s summit (18372 ft.), the antennas of project ALMA (Atacama Large Milimiter Array) can be distinguished. Project ALMA is a one of the most revolutionary multinational ventures to listen to and comprehend the formation of the universe. There are 64 antennas located at the same altitude on Chajnantor flat, which serve to hear the first sounds of the creation of the universe. Later, you return to San Pedro of Atacama. In the morning after breakfast, you begin your trek to the Katarpe Valley. You return through the Valley of the Death, with a view of Pukara (strength) of Quitor. This journey allows you to immerse yourself into one of the most arid deserts in the world with startling landscapes (5 and a half hours trekking with an incline of 1000 ft.). You return to San Pedro de Atacama after midday. You take a stroll to the Moon Valley at dusk to enjoy the sand and rock formations and silence of this stunning natural feature. You have breakfast at the hotel, and then have a day’s long journey dedicated to several sites around San Pedro of Atacama. You are taken to the Hot Water Salt Flat, located at 12956 ft., and visit the High Plateau Lagoons (Miscanti and Meniques). On your way back to San Pedro, you visit the Atacama Salt Flat and the Chaxa Lagoon to understand how this impressive ecosystem works. You return to Sand Pedro of Atacama by the evening, and have dinner at a local restaurant. Early in the morning you head to Tatio. This is a geothermic field located at 14,271 ft., and it has more than 60 vapor fumaroles of hot water that activate when the sun rises. You have a picnic lunch here, surrounded by mountains of more than 16,000 ft.
After lunch, you visit the Machuca village that has a beautiful church dedicated to San Santiago. Before returning to San Pedro de Atacama, you also pay a visit to the Puritama hot springs. You return to San Pedro de Atacama in the evening, and have a farewell dinner at a local restaurant. After breakfast at the hotel, you are transferred to the Calama airport (a little over an hour). Before arriving at the airport, you drive through Calma. This city developed due to its influence on cooper mining at Chuquicamata, an impressive large-scale mining operation. Once you arrive at the airport, this is the end of our services. Drinks and beverages (all meals are exclude alcoholic or non-alcoholic drinks).